A cyclist who died after her wheel became stuck in tram tracks in Edinburgh has been named by police. Zhi Min Soh, 23, was hit by a minibus on Princes Street, at its junction with Lothian Road, at about 08:30 on Wednesday. Ms Soh, from Kuala Lumpur in Malaysia, was a medical student at Edinburgh University. She was described as "talented and thoughtful". The university said it had lost "a bright star of the future". Lawyers have said warnings about tram track safety risks in Edinburgh for cyclists have been ignored by the council. Edinburgh city council said it made "every effort" to raise awareness of the tracks. 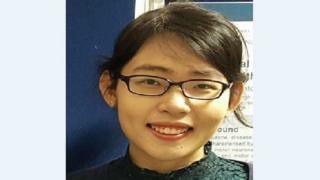 In a statement issued through Police Scotland, Dr David Kluth from Edinburgh University's medical school, said: "Zhi Min was a talented, thoughtful student, who was well-respected by her peers and always keen to help. "She will be deeply missed by the medical school community. "Our sympathies at this time are with her family and friends. We have all lost a bright star of the future." Police have appealed for any witnesses to the incident to come forward. Sgt Fraser Wood of Edinburgh's road policing unit said: "This is a tragic incident and our thoughts are with Zhi Min's family and friends as they come to terms with their loss. "I would like to thank those who stopped in Princes Street to assist Zhi Min on Wednesday morning. "A significant number of witnesses have come forward and we are continuing to speak to them as part of our ongoing inquiries. We will be in touch with all witnesses in due course." He added: "I would again ask anyone who may be able to help our inquiries to come forward and contact us as soon as possible."